U.S. stocks went nowhere Friday as investors remain sidelined by political gridlock in Washington. It's been a rough few weeks for investors, as lawmakers and President Obama engage in brinksmanship over year-end tax hikes and spending cuts. 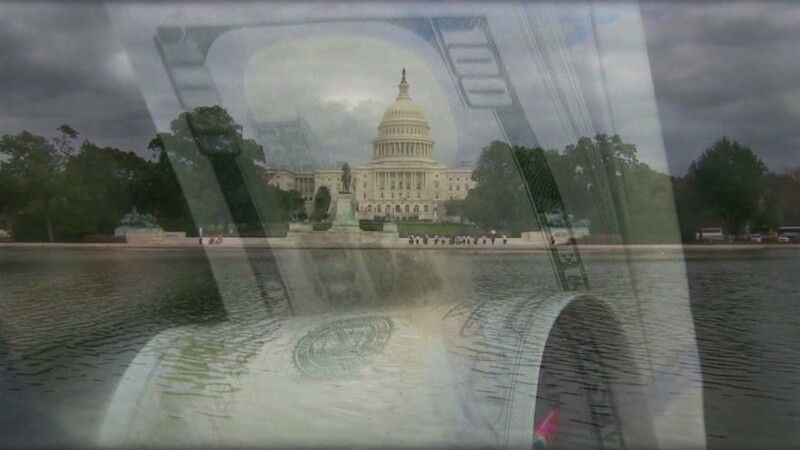 The so-called fiscal cliff could harm the economy at a time when the outlook for growth is already in question. Economic data released Friday weren't helping matters much, with a report showing personal income remained unchanged in October, while spending declined by 0.2%. "That's a concern because the consumer has been a pillar of the economy," said Doug Cote, chief market strategist at ING Investment Management. "The numbers were clearly below consensus and the market didn't like that." A survey of purchasing managers in the Chicago area improved slightly in November, after two consecutive months of declines. The Chicago PMI inched up to 50.4, moving back above the level indicating growth. The Dow Jones industrial average and the S&P 500 and the Nasdaq all ended less than 0.1% on either side of the break-even point. While the Dow and S&P 500 were flat for the week, the Nasdaq posted a weekly gain of 1.4%. Friday also was the last trading day of November, which started off with two weeks of heavy selling. 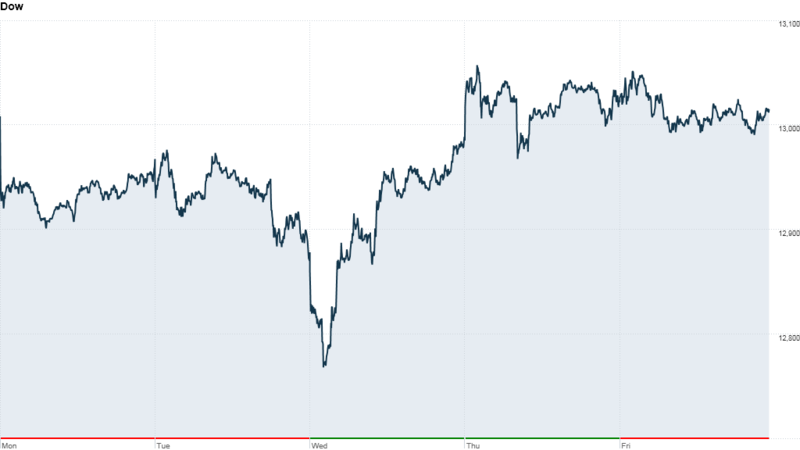 But stocks have clawed back from those steep losses over the past couple of weeks, with the Dow and S&P 500 ending the month nearly where they started. The Nasdaq added 1.1% in November. Meanwhile, the stalemate over the fiscal cliff continued. Speaking in Pennsylvania, President Obama reiterated his call for Congress to extend middle class tax cuts, saying the fight over taxes on wealthy Americans can be resolved separately. "It's not acceptable for just a handful of Republicans in Congress to hold middle class tax cuts hostage simply because they don't want tax rates on upper income folks to go up," he said. The president's remarks came one day after Democrats unveiled details of their initial plan to avert the crisis, including $1.6 trillion in new taxes. Speaker John Boehner criticized the move Friday, saying it "was not a serious proposal." Boehner offered another bleak assessment of the negotiations, saying "right now, we're almost nowhere." In any event, the talks will go down to the wire and the outcome will either be massive spending cuts and tax increases that kick in automatically, or negotiated spending cuts and tax increases, said Keith Springer, president of Springer Financial Advisors in Sacramento, Calif.
"Either way, all Americans are held hostage by the shenanigans, yes I called it shenanigans, and unprepared investors will be punished," Springer said. A few stocks were making big moves Friday. Shares of St. Jude Medical (STJ) rallied after the hospital's board authorized a $1 billion stock buyback. Yum! Brands (YUM) sank after the firm softened its expectations for China, predicting same-store sales in that key market would decline 4% in the fourth quarter. Zynga (ZNGA) shares plunged on news that the terms of its deal with Facebook (FB) had substantially changed. Verisign (VRSN), the company that makes money off the .com registration, sold off sharply after it said it reached a new agreement with the Commerce Department that limits future price increases. Overseas, Asian markets played catch-up Friday, but were also helped by the approval of a new stimulus package in Japan and expectations of strong Chinese factory data due over the weekend. Extending weekly gains, the Nikkei rose 0.5%, the Hang Seng advanced 0.5% and the Shanghai Composite jumped 0.9%. European stocks ended modestly higher, despite news that eurozone unemployment hit another record high in October. The dollar slipped against the euro, but was firmer against the British pound and Japanese yen. In the commodities market, oil prices edged higher, while gold headed lower. Bond prices held steady, with the yield on the 10-year U.S. Treasury note edged up to 1.62%.